much as i've been enjoying my four seasons. winter. bag (i reversed it to the black mod patchwork fabric as soon as the weather warmed up just a couple of weeks ago), i wanted something smaller, lighter. this swing is the perfect, simple bag. it sits easily on one shoulder and because of the length, doesn't need a closure. i did add an interior pocket the width of the main panel and divided into three sections to hold a cell and wallet snuggly, maybe a notebook or paperback, too. other then that, no modifications really needed! this fabric is so beautiful. oh my. and fortunately i've about a yard of each left for something else just as spring happy. so, now i'd better get busy doing that runner and coasters. i've quite a few squares and rectangles cut up, with plenty of scraps yet to use. yummy. hope spring has sprung your way or soon will. let the sun shine in! It is wonderful! I like the pockets on the inside because who doesn't need a little organization in their purse! The fabric is beautiful. You have really been inspiring me to make some purses! oh my. that fabric in that bag is stunning!!! i LOVE the pockets inside... i can only imagine how much use this bag will get. rain here today. i guess that means may will be filled with gorgeous flowers. right? I always love the fabric you choose--it's so bright and lovely. 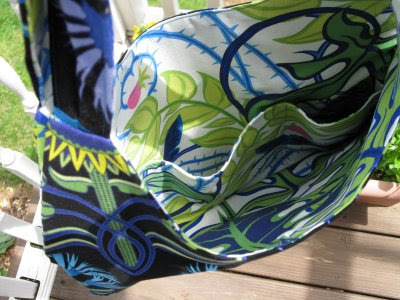 That bag is perfect for all the goodies that are carried around in the spring and summer! Awesome bag! 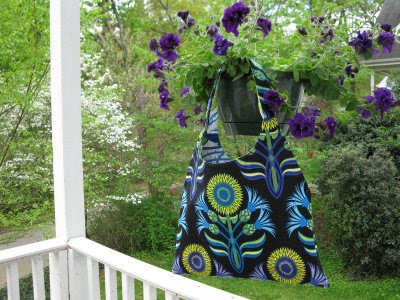 I was so excited to see this bag when you showed us the fabric you planned to use. So vibrant and fun, love it!!! This bag looks like it would be so comfortable on your shoulder and very easy to get things in and out of. Great job! LOVE IT! Especially with the pockets - very pretty! I love this bag! That fabric is awesome! I hope our shop gets it soon. Your new bag looks as happy as you sound! ha! I just love that fabric and I agree with you on the size, it's just right. Yes, I think Spring is here and everyone's a little cheerier (is that a word? ha!). Enjoy all your beautiful weather, flowers, and creating with your beautiful fabrics!